As a digital agency, we develop many platforms and websites for different clients. In the past years, we often encountered the following problem: a developer produces something on his laptop that does not work instantaneously on the laptop of another developer. We had to look for the difference in laptop software and settings. This took time, is frustrating and a complete waste of energy, because this misery can be avoided if all systems are 'containerized' through Docker. A minimal difference in the settings within an application (eg PHP or MySQL) can also take a long time to discover. Also a difference in write permissions can take a lot of time to find out. In addition, each platform or website has its own system requirements anyway: for example, one is ready for PHP 7 and the other requires PHP 5.6. 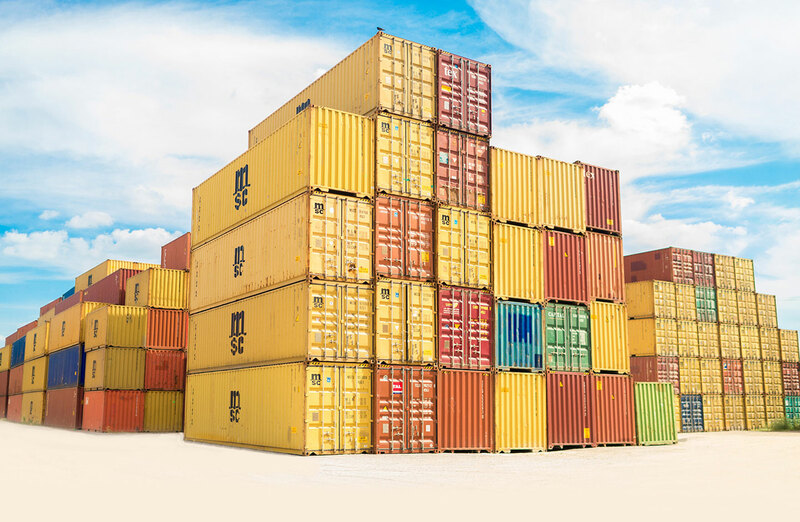 Docker solves these problems: it ensures that a website always lives in the same persistent environment in terms of operating system, associated applications and settings. Wherever you are running the website: locally or an online server - Mac, Linux or Windows. Faster development and test processes. Higher quality in deliveries due to consistency of underlying architecture. Faster and stable live deployments. Consistent continuous integration, which shortens the time to live of new functions. This applies to both support issues and complete sprints. Put simply, within Docker the application is linked to the environment, so that it always has the right server stack. You can see in the above workpiece that within a traditional environment, the Drupal website is separate from the server stack. The server stack therefore differs per environment (laptop or cloud server), giving you the aforementioned problems and frustrations as soon as you want to have it working elsewhere. A bare bone OS (operating system). For example, the Drupal website always has exactly the same environment and it does not matter where you install it. So independent of laptop or server: it will work the same everywhere. Or, not work anywhere which is also important so you can bug-track in your Drupal website. 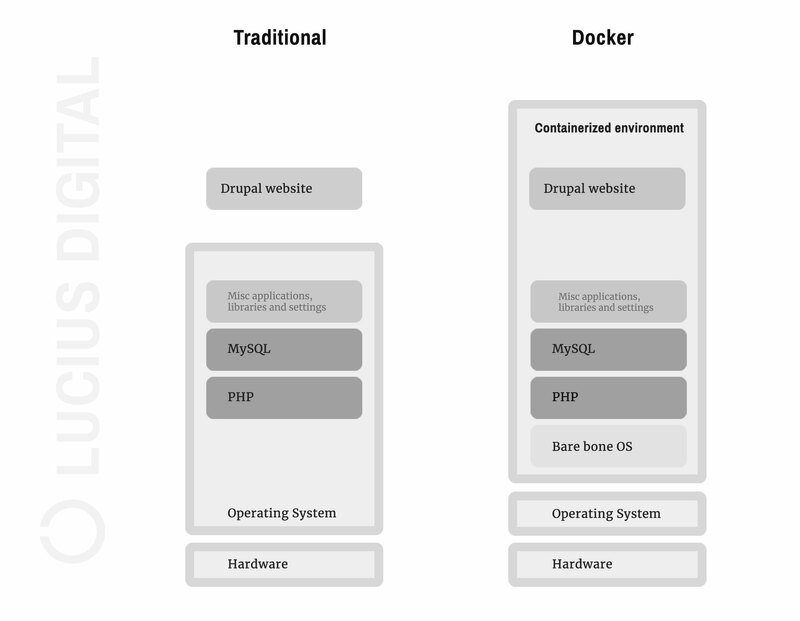 Without Drupal in Docker, the latter scenario also happens too often: a bug in the Drupal website can not be reproduced because it dóes work locally. Where it used to be difficult to install required server applications on your laptop, that is now relatively quickly arranged. You download this and it works instantaneously within a container, where your application can connect to. Because all environments are always the same, Drupal test trajectories will take less time. Because where you traditionally had to test all environments again - now you know (almost) for sure that once the Drupal application works locally, it works on the test, acceptance and live server. There are several variants of virtualization software to solve the 'it worked on my machine' problem. Research shows that Docker is applied on a large scale. Cloud monitor DataDog saw March 2016 13.6 percent of customers running on Docker. A year later that number has grown to 18.8 percent - a growth of almost 40 percent in 12 months time. RightScale noted in its RightScale 2018 State of the Cloud-report that the implementation of Docker has increased to 49 percent from 35 percent in 2017. Compared to other virtualization software, Docker is relatively quick to learn for a dev-ops engineer. In addition, the containerization provides an environment that is faster and easier to keep safe. Docker is also built in such a way that it can be used on other popular dev-ops applications like Puppet, Chef, Vagrant, and Ansible. Source. Docker cooperates with Google, Microsoft, Amazon, Cisco, HP, IBM, RedHat, VMWare (source), whereby the necessary standardization was also made. There are several similar virtualization techniques, but Docker's container architecture makes the difference. Simply put, you can run multiple applications on one VPS - where other virtualization techniques require one VPS per application. Docker containers are isolated, but share the underlying operating system and -if necessary- applications and libraries. With Docker you can use your server resources more efficiently: you can run multiple Docker environments on one VPS - this is not possible with other Virtual Machines. For more benchmarking details herein, see also this blog. Docker is the world’s leading software container platform available for developers, ops and businesses to build, ship and run any app on any infrastructure. No Lock-in: Multi-Linux and Windows. Multi-Cloud. Increase Security, Enable portability and lower costs in 5 days without changing app code. Local SSL relatively easily, via LetsEncrypt. People can collaborate more quickly and easily on an application, without needing all kinds of dev-ops knowledge. Because your application is instant portable you can switch from hosting provider easier. Large projects can be more easily split up into small teams, using CI tools like Jenkins the code from different teams is integrated. Create sandboxes quickly and destroy them, so that everything stays clean. Docker has a large ecosystem. Moby: open source version of Docker. Kubernetes: makes a group of containers into one 'logical unit', so that they are easy to manage. Kitematic: easy containers run through a GUI on a Mac. Docker conferences are held annually, this year it takes place in San Francisco. For more info, see Dockercon.com. Live environments for customers: some customers would like to host themselves, but do not support Docker yet. On MacOS, some Docker related actions are unnecessarily slow. All developers have to master the technique before your organization can completely adopt. The it worked on my machine problem is a thing of the past with us, but some systems have to be completed but we are almost there. This saves everyone, including product owners (our customers) a lot of time and energy. Deliveries go faster and better, what more do you want? Questions or additions? Let me know!